I would not get through the cold Winter months without my trusty boots. Anyone who knows me will know I'm a boots girl during A/W and slip on the sandals as soon as I catch a glimpse of sun or some warmer weather. I live in them day in, day out, without fail, and they definitely get worn out. I just think boots are so easy to work with, you can wear them casually in the day with some skinnies and chunky knits, or just as easily work them into a more dressy look - I'm thinking rocking up a cute dress with some tights and boots for an edgy feel. This year I've invested in a long pair of boots which I hope will get their wears worth for a few years and three (yes, three...eek) pairs of ankle boots which I will pair with my various Autumn/Winter wardrobe. Here are my investment boots. Named so because I'm really hoping they last me and are worth the investment. I usually buy a pair of long boots every year if not every other year and wear them so much that they almost fall apart so thought this year I would invest in a classic pair that should see me through for a while. This lovely pair is from Russell and Bromley and to my surprise due to their look, are entirely made from leather. They're sturdy and comfortable and because of the stretchy pleated soft leather, fit like a glove around my calf as well as having a great texture to admire! My final pair of boots is also from Next (Next did good this year!) and are a pair of wedge boots. They're also available in black but I thought it would make a nice change to have a mink pair of boots as I tend to gravitate towards black at this time of year. The wedge is so comfortable and can look both casual and dressy but these are suede so will take more looking after thanks to the constant rain we get in the UK towards the end of the year! 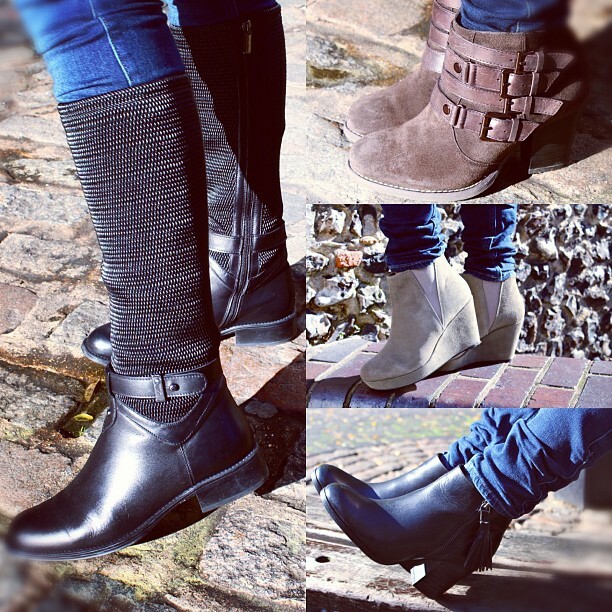 Are you a boots girl like me or do you dedicated to your flats? Absolutely love boots! :) Greetings from Munich! The R&B boots are A M A Z I N G! Love them! I wish you could order them online! I am loving your last tan wedge booties. How adorable!! Loving each pair! Great set for the winter.